We know that cells are the building blocks of our bodies. But they are not like inert wooden blocks. They are complicated tiny machines that communicate with each other to make sure that the many simultaneously occurring processes in our bodies are in order. Stem cells participate in many of these cellular conversations, and a particularly important dialogue is the one that turns certain stem cells into specific types of cells, while keeping others in stem cell state. Retaining stem cells ensures that our bodies can fix the wear and tear of our organs and tissues in future. So how exactly do cells talk to each other? They send signals using molecules. 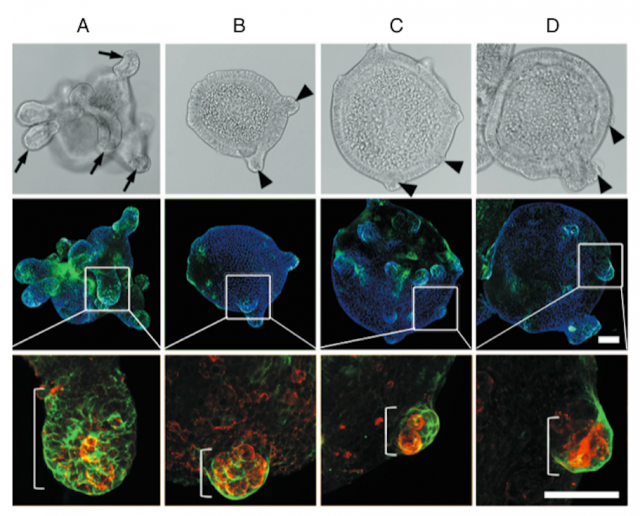 Setting up a gradient of a certain molecule is one way cells send signals. With many molecules on the surface of cells in one area, and gradually less molecule across space, cells can receive a range of different messages depending on the density of the molecule. Researchers from the Hubrecht Institute in Utrecht and UMC Utrecht visualized stem cell signaling in the gut for the first time. Their question was how one of the main growth signals in the gut sets up a gradient. They used artificially made mini-guts (read more about organoids here) to study this process. Image: Farin, H. F., Jordens, I., Mosa, M. H., Basak, O., Korving, J., Tauriello, D. V., ... & Clevers, H. (2016). 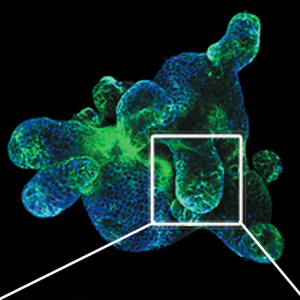 Visualization of a short-range Wnt gradient in the intestinal stem-cell niche. Nature. The image above shows a part of this mini-gut called the crypt, which are the protrusions that give our guts high surface area to allow absorption of nutrients. In panel A, the protrusions are allowed to grow normally. In panels B, C and D, the signal that allows the cells to divide and form the gradient is blocked. Since the signal can’t spread the protrusion can’t grow. Learning how stem cells signal is important for developing methods to help our bodies regenerate, and to stop this process when it goes awry in the formation of tumours.